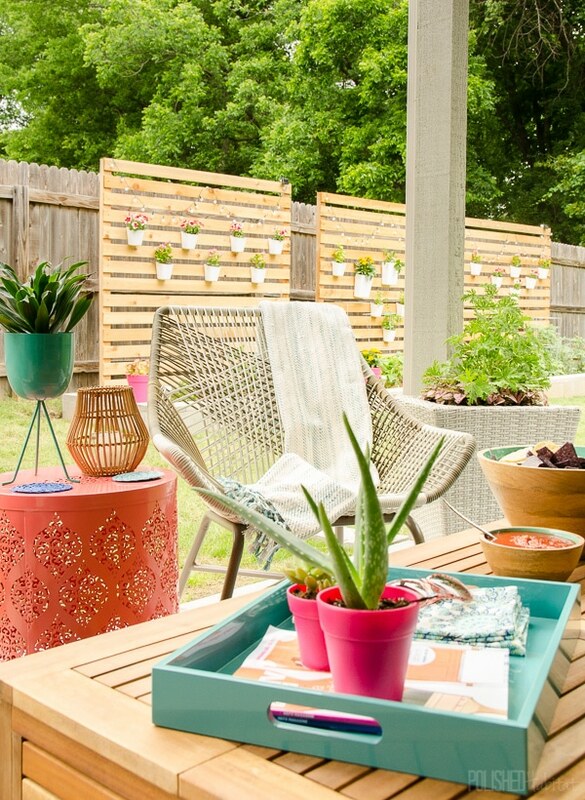 You are here: Home / DIY & Crafts / Back Porch Makeover Reveal! Changing our underused back patio into an outdoor living area was the best decision we made last year! For the last week, I’ve entered a state of bliss each time I step into, or even see, the backyard. We still have a couple of big projects left on the list for this year, but the two parts I’ve been looking most forward to are now complete! With the vegetable beds built and planted last month, we turned out attention to the back patio. It was set up as a dining area before, but I was constantly longing for a more welcoming spot to get comfy with coffee in the morning, and maybe a glass of wine in the evening. Most of all, I wanted a retreat from our habit of crashing on the couch in front of the TV while simultaneously working on a laptop or scrolling through social media on a phone every evening. Can anyone relate to that scenario? I find it much easier to be still and relaxed outside, and that quiet downtime has been desperately needed around here! 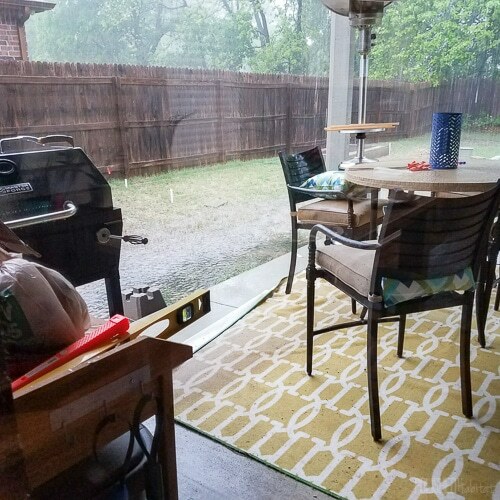 We decided it would make the most sense to change the covered patio into an outdoor living area, which would keep the cushioned furniture out of the weather. Then, later this summer, we’ll extend the patio with a deck and that will become a dining space. As a reminder, here is the mess that we started with a few weeks ago. Not exactly a relaxing spot to run away from technology, right? 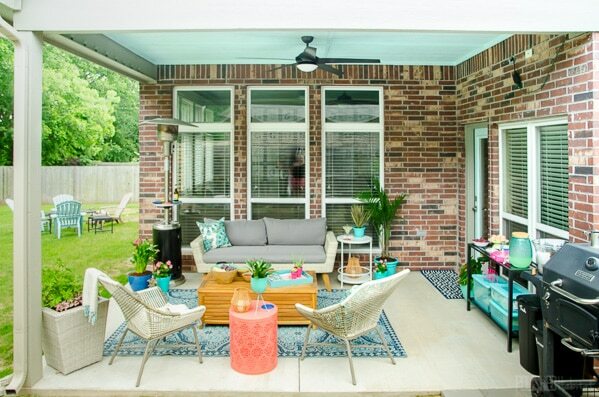 Our first step was inspired by all the beautiful blue porch ceilings I saw on the trip to Charleston. We painted the ceiling and back door SW Tame Teal. 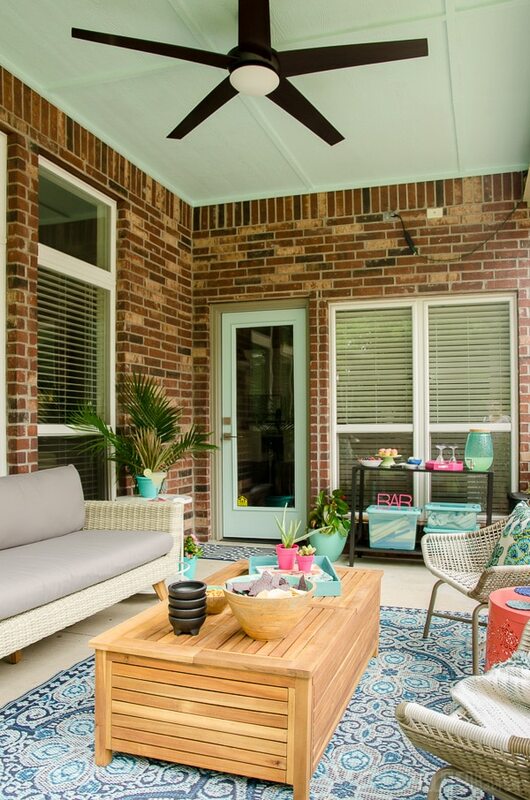 Then, we replaced both the ceiling fan and door hardware with more modern versions that better match both our style and the new furniture. Once everything was painted, it was time for the really fun part – a Cost Plus World Market shopping spree! As I mentioned in Friday’s birthday post, I was overjoyed to be selected to partner with them on this makeover. PS: Links are also affiliate links, so you pay the same price and I may receive a small comission if you decide to purchase. Win-win! I found tons of ideas from their inspiration rooms and ended up combing pieces from three of the looks to create our own unique space. I’m going to link all the products in a shopping section at the bottom so you can find all the sources in one spot, but I wanted to mention the why behind some of the pieces as we go. 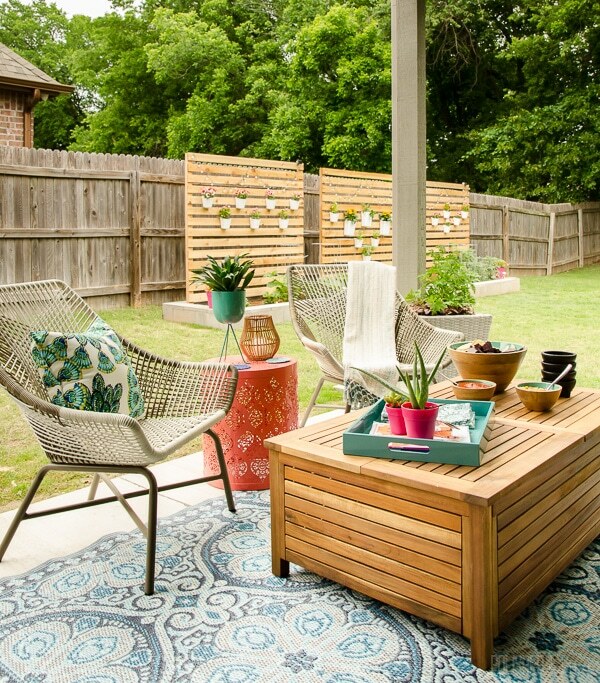 Hopefully, the reasoning will help you think through creating your own outdoor oasis! Adding a cushioned sofa was my first priority. I fell in love with the Marina Del Ray collection’s modern look. Because our weather can be so harsh, I put this piece in the most protected spot against the windows, then selected everything else to work around it. It wouldn’t be a project of mine without some storage and organization, so the Praiano Wood Storage outdoor coffee table is perfect. The top comes off in four sections and the entire inside is storage! 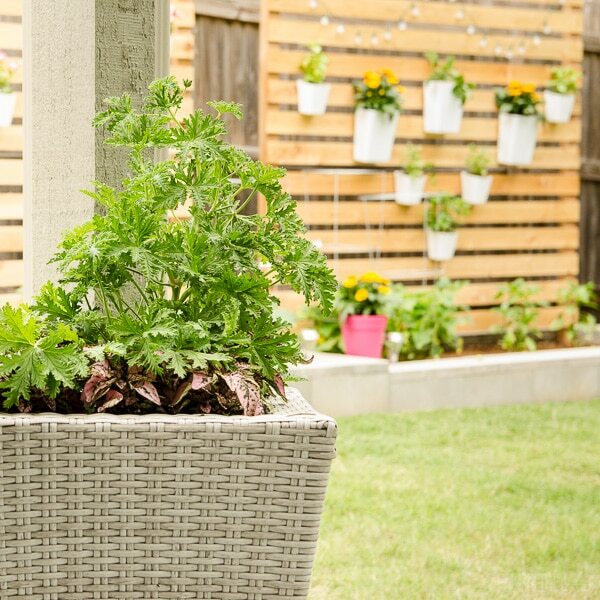 I love that the wood adds a bit of warmth AND the slats mimic the look of our veggie garden. Across the sofa, I wanted additional seating for entertaining. 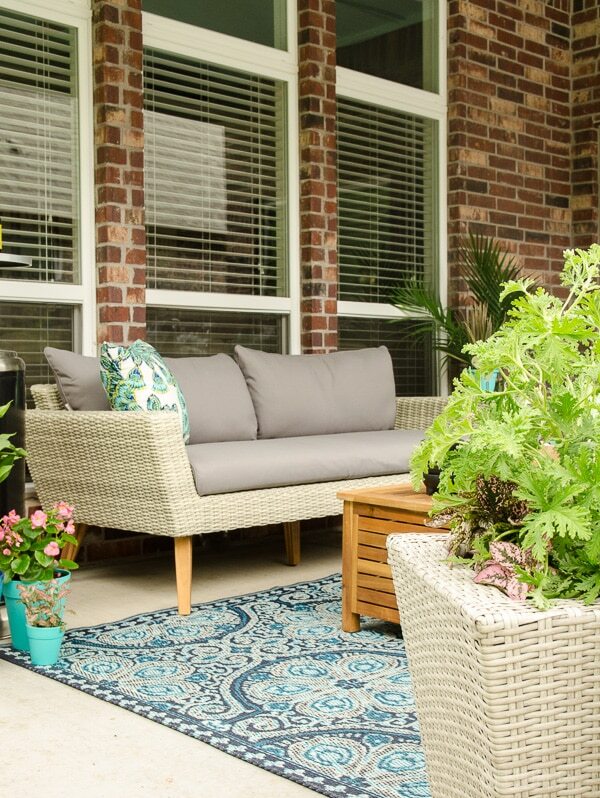 This side of the porch has to endure more hot sun and rain, so I was looking for something that didn’t have fabric cushions. Style was also a big factor because the chairs would be facing the inside of the house. The chairs look just as good from the back, which is awesome because you’ll see the back from our future outdoor dining area. And while we’re looking at this view, how great is that little coral punched stool that I’m using as a table between the chairs? 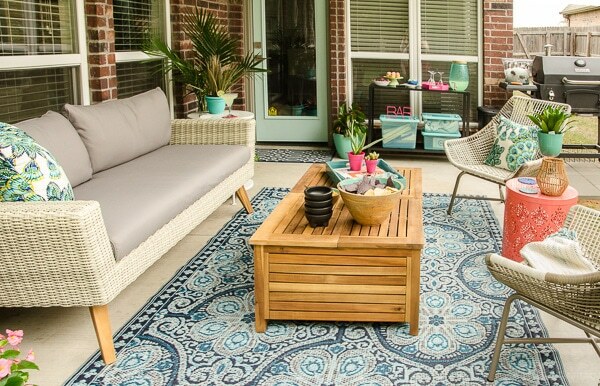 Somehow I haven’t mentioned my favorite thing yet, that gorgeous outdoor mat! It was crazy inexpensive for a 6′ x 9′ rug, and because it’s made of almost a plastic material, it’s been very easy to keep clean. I was nervous ordering it sight unseen, but I’m a convert to these mat coverings for outdoors now. The last piece of furniture I added was a little white table next to the couch. I was worried about the area next to the door feeling too crowded, so went with a light and airy table. 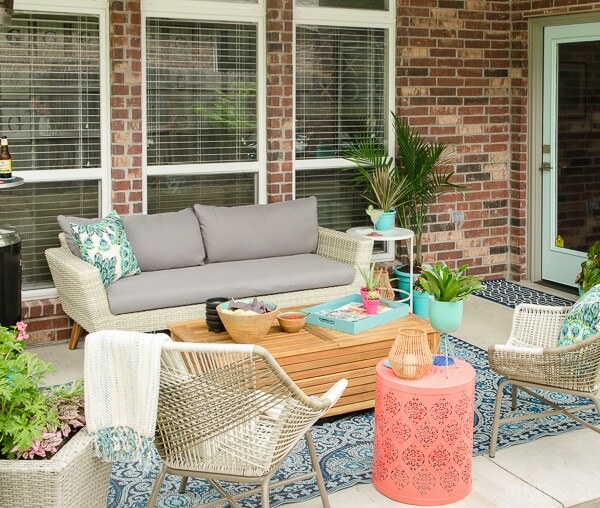 With all the furniture in place, I just needed some outdoor decor and lots of plants to make the porch feel cozy and welcoming. 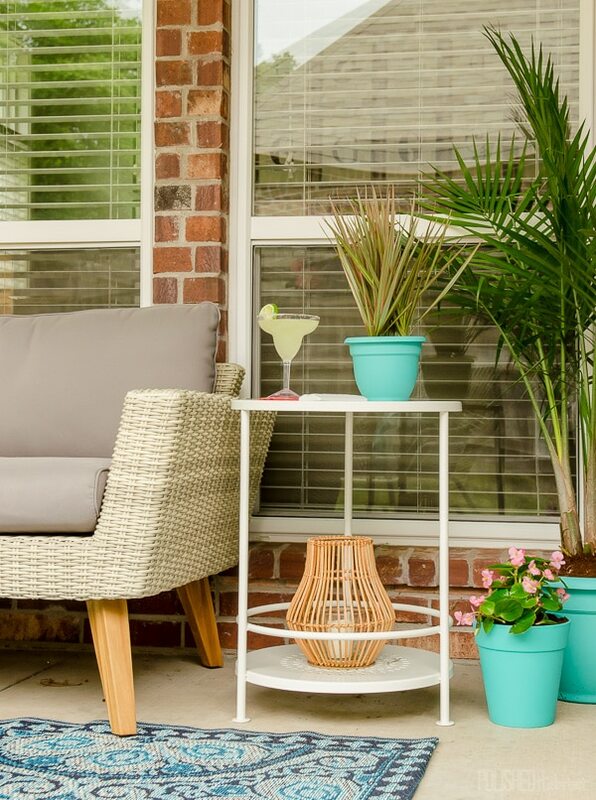 I realized my tall planters from the front yard were gray and woven just like the couch, so I hauled one to the backyard and filled it with a big citronella plant to keep the mosquitos away. I’m loving how well the gray accents on the patio tie back to the concrete beds. It’s so amazing seeing the backyard come together! Are you ready to tackle your own space now? As you read, you may have noticed my best tip for pulling everything together. Repetition! Find a 3-4 colors, patterns, or textures that mix well together and make sure you have a few examples of each. For me, the primary three things were the color teal, linear wood, and woven gray. Navy, black and white all played supporting roles as well. The final touch was the little pops of coral and pink! If you loved anything I used in our space, I made a little grid for you below. Click on any of them to go right to the product pages. Oh, and almost everything on the list is on BIG sale right now, including the sofa being 50% off! Every single morning since we’ve finished the space, I’ve grabbed my coffee and headed straight outside. It’s such a relaxing place to start the day! If you’re recharged by spending a little time outdoors like I am, please don’t wait 5 years to create a little retreat like I did! We’ve already had my parents, brother, and nephew over for dessert on the patio after our birthday/anniversary dinner. I look forward to many more nights like that with family and neighbors! Finishing this project has made me even more excited that Cost Plus World Market is opening in Tulsa next month! In the past, we’ve had to go to Dallas or order online, so this is HUGE for us! If you’ve never been inside one of the stores, check out their store locator page and get going! 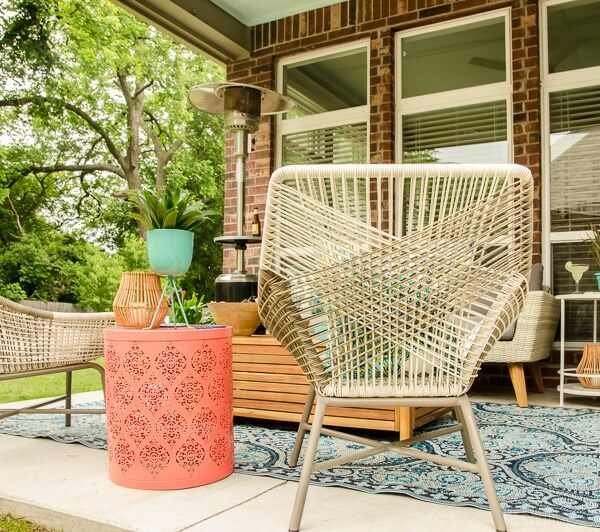 For even more outdoor inspiration, check out this video with tons of ideas for getting an indoor look outdoors. Here’s one final look at the before & after. I’m in love! « It’s My Birthday Giveaway -2017 Edition! Absolutely! I hope your weather straightens up soon too! Yay! I loved reading about your patio update. Having a comfortable outdoor space is important to me too. Also, love those chairs! Going to check them out and see if they come in other colors too. This looks so relaxing! I absolutely love it and how you mixed different pieces rather than just buying a set. They all compliment each other so well! This definitely gets my wheels turning for our outdoors ?Can’t wait to see the rest of your backyard when it’s finished! 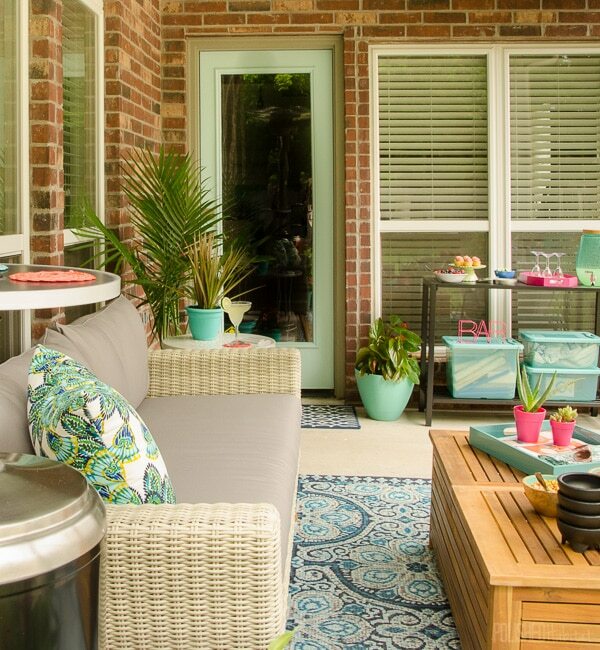 Looks so inviting and I’m loving your color scheme! I can’t wait too show this to my husband ? I absolutely love the fan too! Is your ceiling viny and if so what kind of paint did you use? Thanks, Cornelia! That fan works WAY better than the one we had before, I’d totally recommend it for both style and function. We found it in the store at Lowes. Our ceiling is wood, so we just used exterior latex paint. I was curious about painting vinyl, so I did a quick search and found this: https://www.sherwin-williams.com/homeowners/color/find-and-explore-colors/paint-colors-by-collection/vinylsafe-colors-for-vinyl-siding Hope that helps! Wow! Looks great! Just love the blue/gray rug. The whole is such a remarkable change! Love to sit and visit with you and drink a cuppa. How inviting! Wish I had something like that. We need to get a roof over ours first and then I’ll be looking at yours more closely. Such a great place to go each morning. I LOVE IT!!! This is similar to what I want to do in my teeny, tiny back yard. 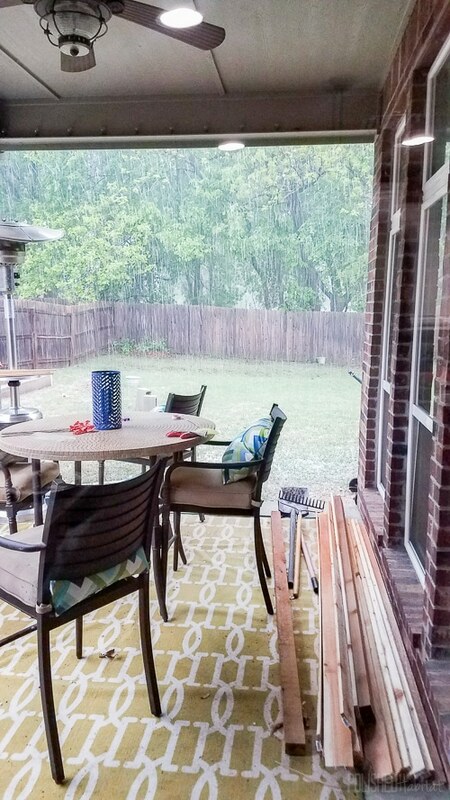 I want to extend the covered patio with pavers to create a dining area which will give us more space to create a nice sitting area on the itty, bitty covered patio. 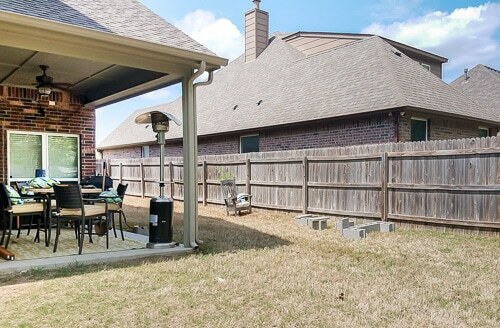 I have BIG plans for our back yard…just gotta get my husband on board. Unfortunately he can’t read my mind yet so he’s not understanding what I hope to do. The place looks beautiful! You’re a very talented decorater, congratulations! A year late on posting, but where did you find the console-esq table you used for your bar? I need something that size, but seem to be striking out in regards to finding everything. The space is beautiful and I love the blue ceiling. The link you posted above for painting vinyl is going to come in handy in my future. Hi Caroline, We picked up the table in store at At Home last year. Hopefully, they are carrying them again this year because it was affordable and came in two different sizes. Thank you so much! We screened in our porch last year, so my goal this year is to make it beautiful. 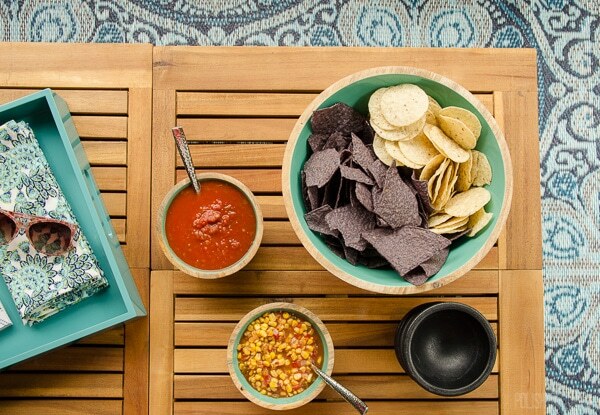 A good table will come in handy for that. It’s just lovely. We need to do the same thing and bring the indoors outdoors. It’s a beautiful outdoor setting! I’m curious about the structure in the next to last photo. It has potted plants hanging on it. Is that a post you’ve done previously? I really like it and could use something like that. I enjoy your blog…so much good info and I like your taste! Tell me a bit about the large vertical “walls” you’re using as planters in the yard.